I recently bought some face masks from Superdrug to try out. I have always been a big fan of Superdrug’s own brand masks as they are inexpensive and really effective. They are usually priced at 99p each and since they are currently doing the 3 for 2 offer on Superdrug Face masks, it is a good time to stock up on your favourite masks. 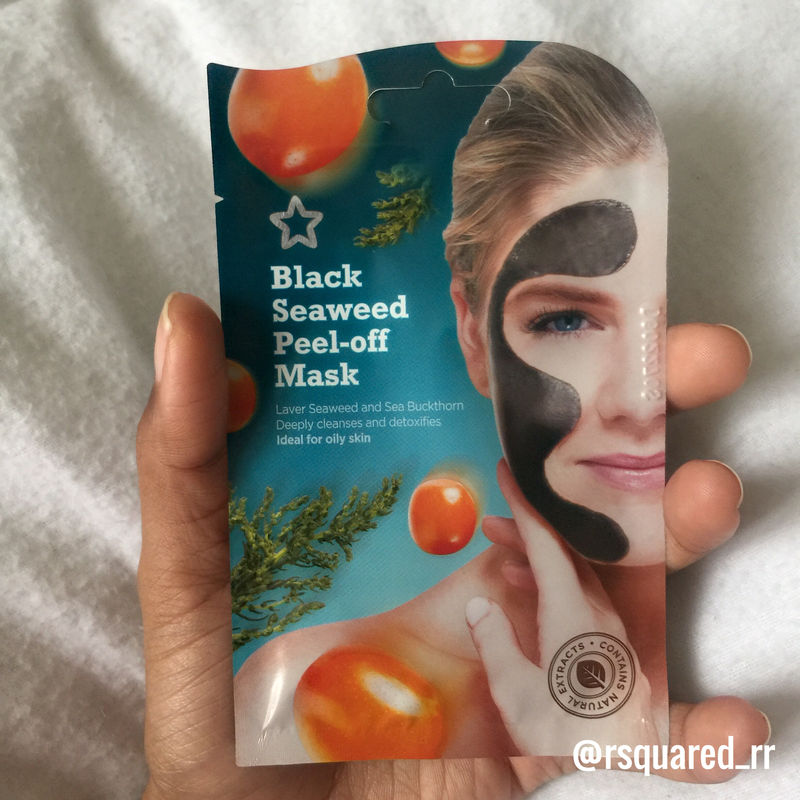 I tried the Black Seaweed Peel-Off mask last night and was really impressed with the results. The formula is quite thin so I put on quite an even, thick layer and let it to dry for 20 mins. It may take a bit longer or less to dry depending on your room conditions. Once you peel off the mask, just wash your face to get rid of any residue left on your face and pat dry. I always follow up with my night moisturiser to lock in that moisture. 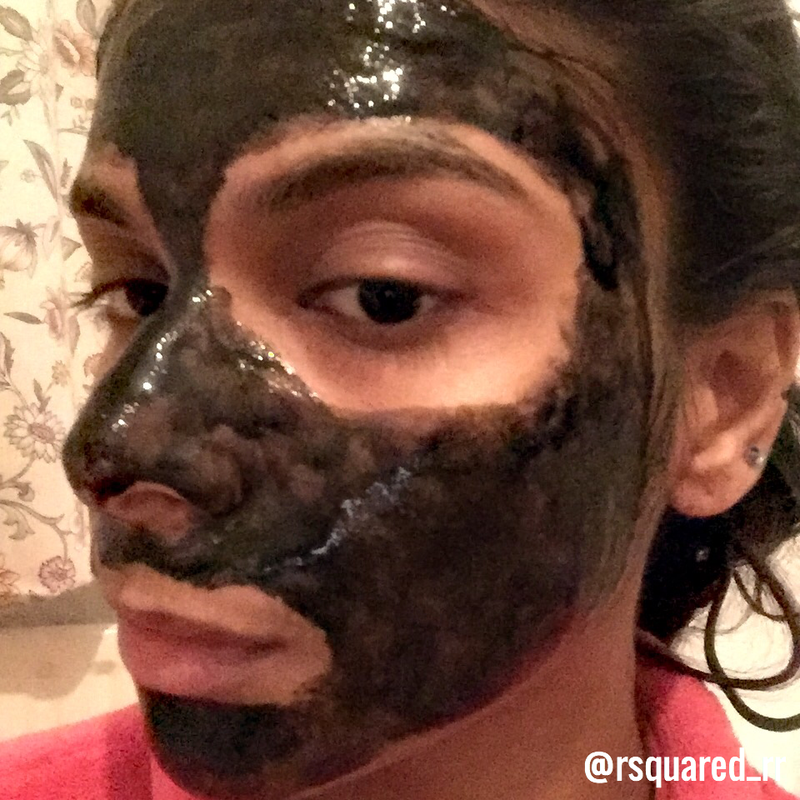 When I started peeling off the mask, I could instantly see a visible difference on my skin. My face looked cleaner and brighter instantly – it definitely gave my skin a good detox. It also gave a blur effect on the pores which made my skin look smoother. However, since it was Black Seaweed, I wasn’t a big fan of the smell. If you have a sensitive sense of smell, this smell may not appeal to you. It needs a bit of time to get used to the smell. I am still divided with this fact as it does really good things to my skin but I’m not really sure if I can stand the smell for 20 mins. I should probably put a thinner layer around my nose and upper lip area the next time so the smell doesn’t put me off. I love the results this mask gives and I do recommend you to try it out. But I would suggest you to pour the mask in a clean bowl as it can get quite messy if you apply it directly from the packet. Hope you guys find this post useful. Take care. I love finding and visiting new food places that are within my budget. One such find was a pizza place in London Wandsworth called Pizza Storm. 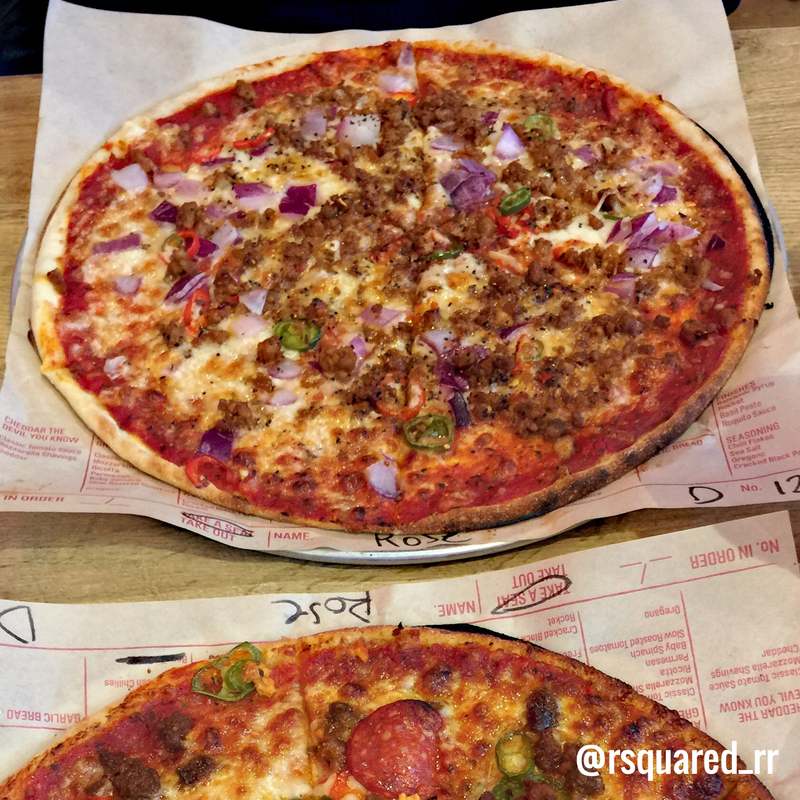 You have two options there – choose a pizza from their menu or create your own pizza with a choice of over 50 toppings. The restaurant has a lovely environment and interior and the ordering system is quite interesting. You could create your own pizza with unlimited toppings for £8.45 or choose one from the menu for £7.45. All their pizzas are 11 inches and are stone baked. They also have a good selected of sides and drinks to go with the pizza. They do a couple of meal deals which are so worth the money. My boyfriend and I visited the place when they newly opened in Wandsworth and had the £15 meal deal. However, their meal deals change regularly so it is better to check their website before you go. For £15 we got– 2 pizzas, 1 side and 2 drinks. It is one of the best meal deals I have come across. I will definitely go back there as their pizzas are so tasty and so worth the prices. They have only two restaurants – one in Newcastle and the other in London Wandsworth. If you guys are around these areas I do recommend you to check them out. 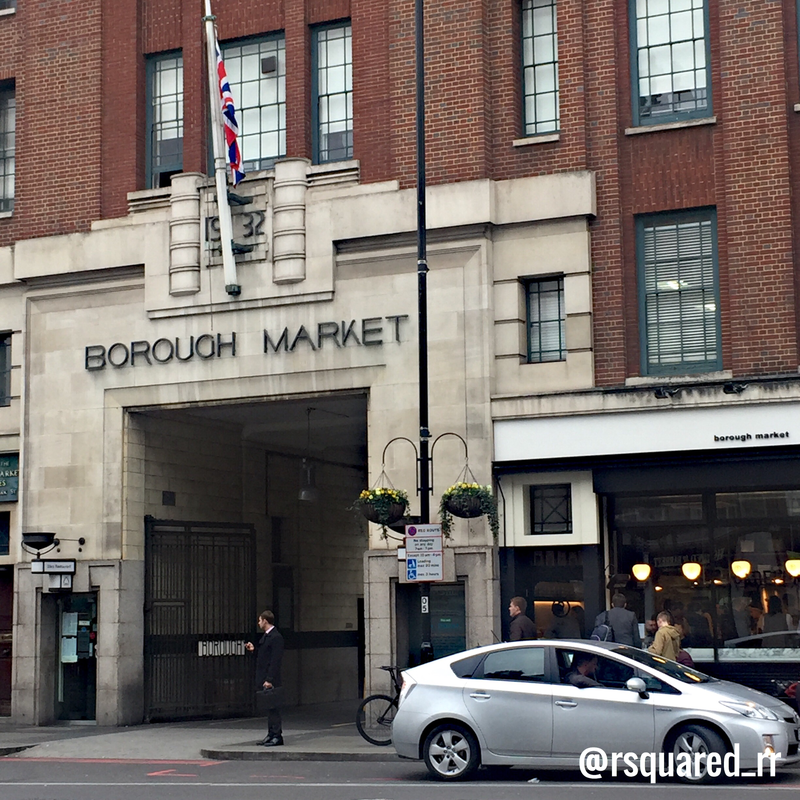 I had recently visited Borough Market as I had heard so much about it and had been finding the time to visit it. 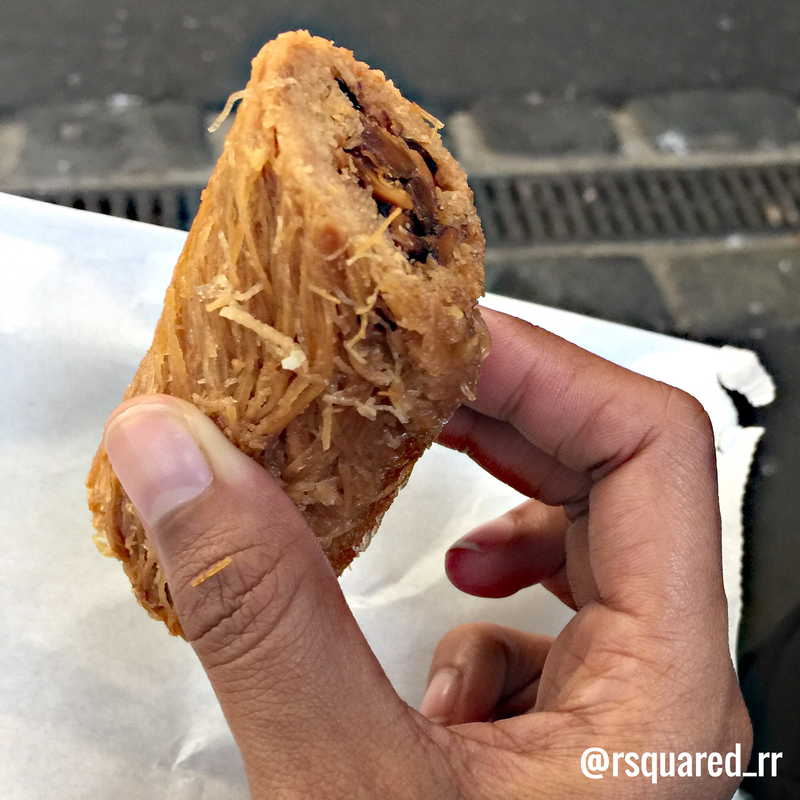 It is located in Southwark near London Bridge station and is one of the oldest markets in London. They have a large variety of stalls from fresh fruits and vegetables to burgers and ethnic foods. They also sell fresh meat, fish and cheese in the market. 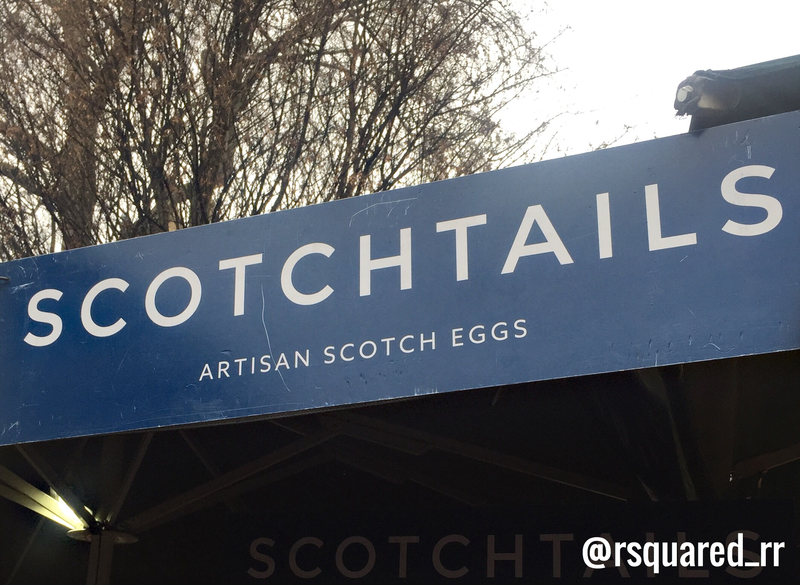 I first tried out the scotch eggs from ‘Scotch Tails’. This was the first time I tried freshly made scotch eggs and it was love at first sight. 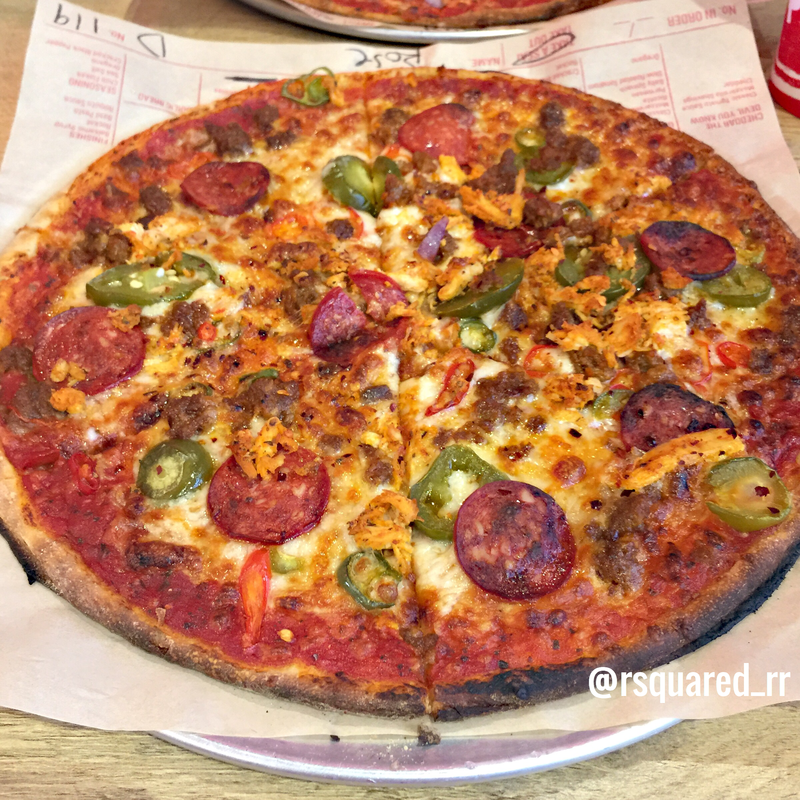 The meat was so flavourful and the crust was very crispy. They serve just the eggs on salad or as a meal deal with scotch eggs and sweet potato chips. 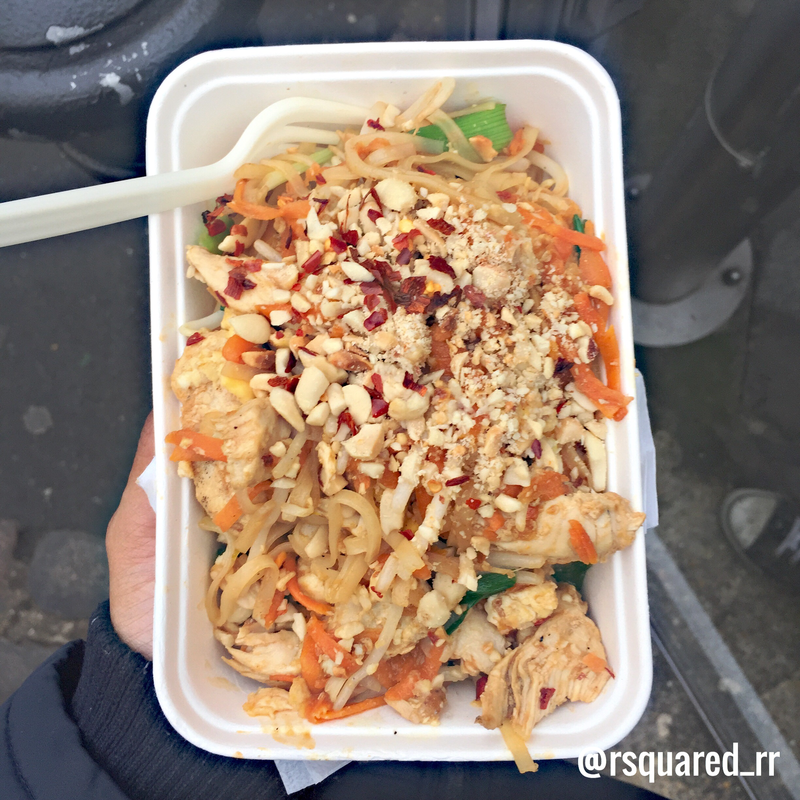 I then tried the Chicken Pad Thai from ‘Khanom Krok’. It was nice but I wish they had fried the chicken a bit further to give it more flavour. However, this is more of a personal taste and not everyone may agree with me. I wanted to try their Coconut Pancakes but I couldn’t as I didn’t want to break my spending limit and I still had to buy dessert/sweets. I then went to the sweets stall where they sold baklava, Turkish sweets and roasted and caramelised nuts. I bought some baklava and called it a day. I loved walking around the market and finding new treats for me to try. It was a lovely experience and since I went when it was quiet, I was able to see what each stall had to offer. If anyone is looking to try rare meat burgers, Borough Market is the place to be. 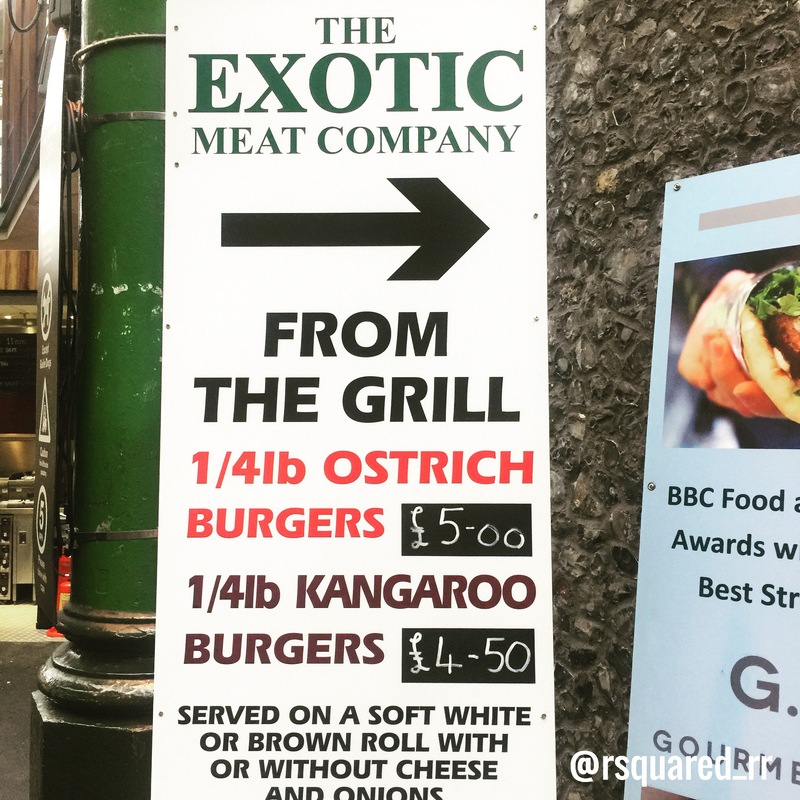 ‘The Exotic Meat Company’ in the market serves ostrich burgers and kangaroo burgers. I haven’t tried them but I have seen many people trying it. Hope you guys enjoyed reading this post. Take care. Being a budget blogger, I always search in Instagram using the hashtags #budgetblogger #frugal #frugalliving #moneysaving etc. During my searches, I found one prominent thing that many people use. It is an app called Shopmium. After a while, I decided to download it and give it a try. I was quite impressed with this app. There are many ongoing offers in the app such as free items or 30% off or other types of discounts. You get a £3 credit if you refer a friend and your friend gets a freebie. You can use my referral code in the Sign Up page (Mobile app only) if you are downloading this app. They pay you directly into your bank account or PayPal. 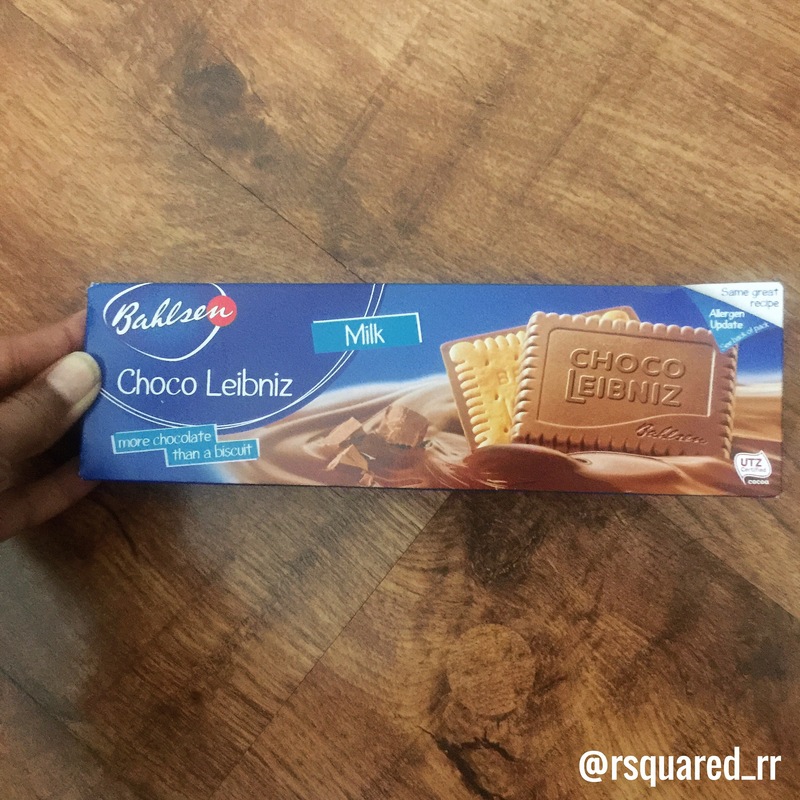 I did give it a try and bought the Bahlsen Choco Leibniz biscuits. I followed the steps mentioned above and got my cashback in less than two days. It’s amazing. I got a pack of biscuits FOR FREE. Who does that? Who gives you free stuff in London? I am really liking this app. I hope to save more money using this app. Hope you guys found this post useful and do let me know if you tried this app out. 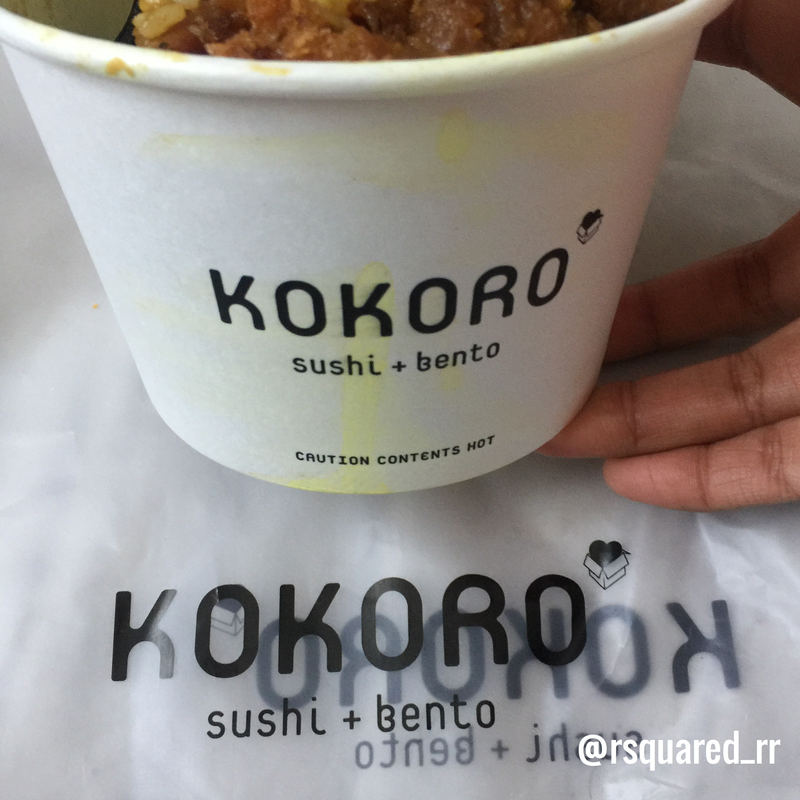 Recently I came across this restaurant called ‘Kokoro – sushi + bento‘ near Wimbledon train station. Since I wanted a change in my lunch, I went to check it out. They provided affordable and good quality Oriental food. They had a large selection of hot and cold food as well as some drinks. The hot food had two size portions – regular and large. I chose the regular portion size and I was very happy with how generous the portion size was for under £6. Most food options are under £8. I went for the ‘Sweet and Chilli Chicken’ with rice option. They also do a noodles option if you are not a fan of rice. The ‘Sweet and Chilli Chicken’ was excellent with the right amount of sweet and chilli. Some food places overdo the sweetness which spoils the whole meal. But Kokoro’s Sweet and Chilli was the perfect blend of both spices. Having a good first experience with Kokoro, I decided to go in for lunch again. This time I went for the regular ‘Chicken Katsu Curry’. Once again I was really happy about how generous they were with the chicken with decent amount of curry sauce. The next time I go, I would probably try the ‘mix and match’ option and go for two different curries with rice. It is a really quick and convenient food place to go for lunch with good quality, fresh and affordable food. I would recommend it to anyone who likes Oriental food. They have around 12 stores around England. If you want a quicker lunch, they also serve sushi, gyoza, salad and soup. The Wimbledon store is more of a takeaway type format with limited seating. There is usually a queue during lunch hours; however they do serve food quite quick so there isn’t much of a wait for food. Do let me know if you try out Kokoro and your feedback on it. I decided to have more healthy snacks this year and I have so far successfully stuck to it. 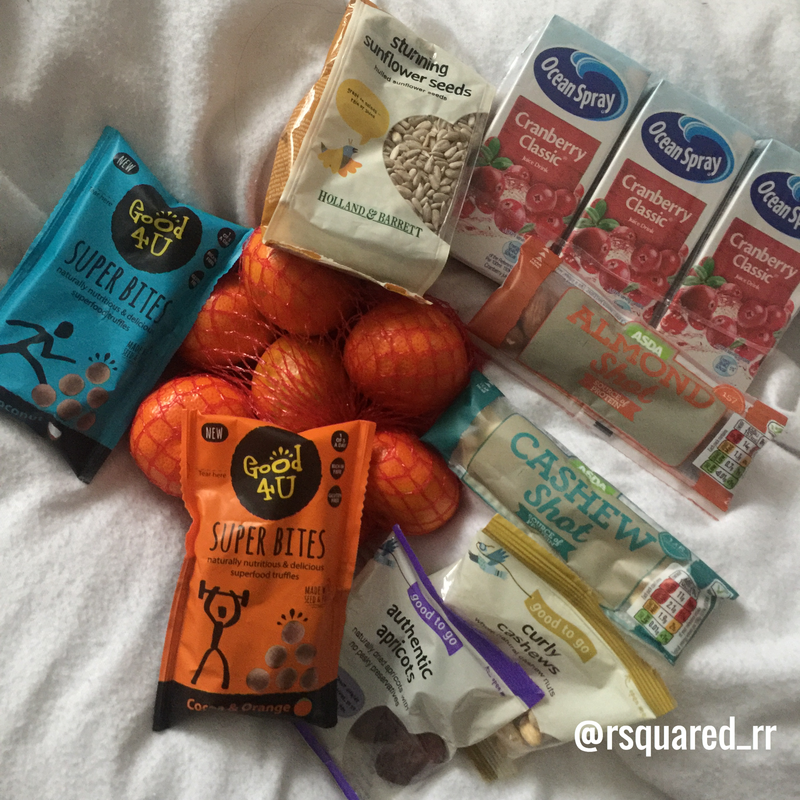 I have cut down on crisps, salted snacks and cookies and made way for more healthy snacks. You could have three healthy meals a day, but unknowingly you may add unwanted calories, sugar or salt to your body in the form of sneaky snacks you have between meals. Sometimes healthy snacks can be expensive, so I tried to compile a list of affordable snacks. Being the lazy student as I am, I also try to find snacks that are easy to make and eat. These are ones that I have tried to snack on when I feel peckish. Bananas or Apples – you can get organic bananas and apples at really affordable prices from most shops. Unsweetened yogurt or Greek yogurt – I usually buy the unsweetened ones to avoid unwanted added sugar. This gives me more control over the sugar that goes in my yogurt. I usually sweeten it with natural honey. Clementines/Easy peelers – mainly because I don’t want to cut up an orange and then eat it. Plain almonds – I usally buy the pre-portioned packets of nuts to stop me from eating a full packet of almonds or cashews in one sitting. Smaller packs also make it easier to have it on the go. You could also buy the bigger packs and make smaller ones at home. It can be much cheaper that way. Popcorn without any added butter or salt/sugar – not the microwaveable ones. You could either make them at home or buy the healthier air-popped popcorn packs. Nut butter and rice cakes – I love my nut butters, whether it be peanut, almond or cashew. To stop me from going overboard with the nut butter, I stick to two tablespoons each day. If I am on the go, I just take with me the nut butter pouches that are available in most shops these days. I either go for Meridian (100% peanuts) or Pip and Nut (98% peanuts and sea salt) and they have no added sugar. I buy most of my snacks other than the fruits from Holland and Barrett as they are mostly affordable and they usually have good offers regularly, such as the ‘Buy one get one half price’ happening right now. During such offers I tend to stock up on my essential snacks to help me save money. Why pay full price when you know it will go on offer 🙂 I don’t know what I’ll do without a Holland and Barrett. I don’t have an Asda nearby. But when I come across one, I pop in to buy some snacks from them as well. 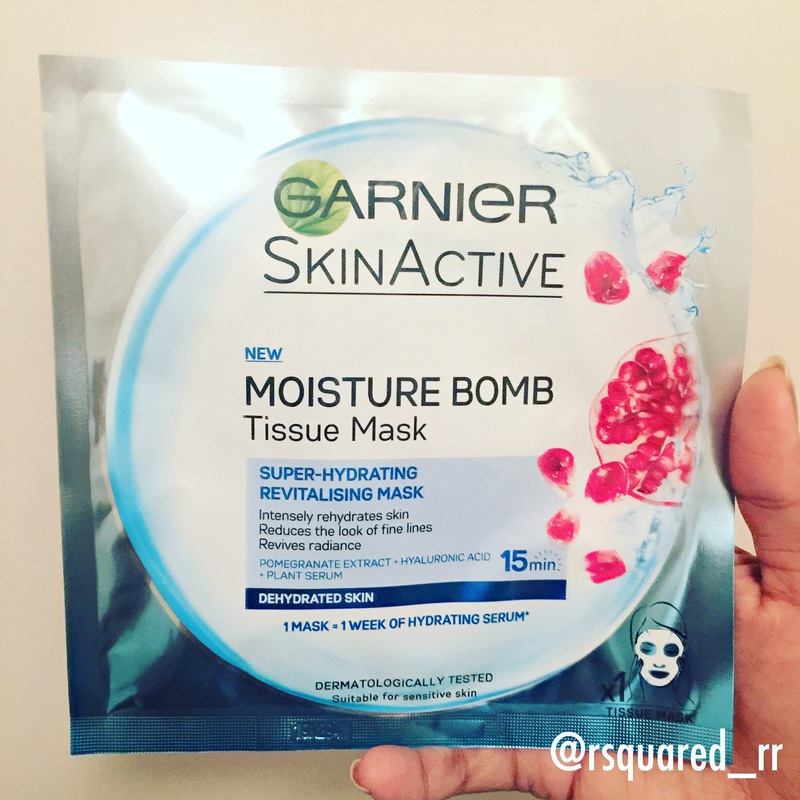 Couple of weeks ago I bought the Garnier Moisture Bomb Sheet Mask after seeing it everywhere. I bought it for 99p from Boots when it was on sale. Since it was extremely cold for a week in London I thought to give my skin some pampering. I have oily/combination skin and usually my face looks dehydrated after a going out in the cold weather. I was also ill for a couple of days so an intense hydration for my skin was needed. When I first put it on, it sat on my face well and did not slide off. It contained a lot of serum that I thought it would slide off my face when I stood up – but it didn’t. I didn’t also have a problem with the shape or size of the mask as it fit me quite well and didn’t have much overlapping layers. I felt this nice, cold, tingling sensation on my face, so I thought that the product must be working. After the stated 15 minutes, I took it off. The mask was still moist and there was quite some serum on my face. I just massaged it into my face and left it there to dry before going to bed. The next day I saw that my skin looked plumper and radiant. But as the days got on I felt that the oily parts of my face were a bit more oily. So the mask has worked and given me hydration and plumpness. However, I felt that the oily zones of my face got more oily/hydrated that it felt a bit sticky. But the hydration lasted a good few days. This mask would world well with normal or dry skin however not so much with my oily/combination skin. I would stick to using it only during the harsh, cold winter months when my skin is really dry. I have also seen some reviews that it was harsh on some sensitive skin people. So please do be careful if you have sensitive skin. Hope you guys found this post useful. Take care.